Wild Radish is not easily confused with other wild plants on this web site. This is a bristly, upright annual or biennial plant which is found frequently as a weed in fields, and on bare, waste ground. It's a bushy plant with many branches of hairy stems which bear very pretty white or pale yellow flowers (25-30mm across) in loose heads from April to September. These 4-petalled flowers have lilac veins and are worth examining with a hand lens. The sepals are red tinged and also bristly. In some areas the flowers can be purple or even light orange. The lower leaves are pinnately lobed, the upper being less so. This is an introduced plant and it belongs to the family Brassicaceae. I first identified this plant growing at Ballyteigue, Co Wexford in April, 2009 and photographed it at that time. 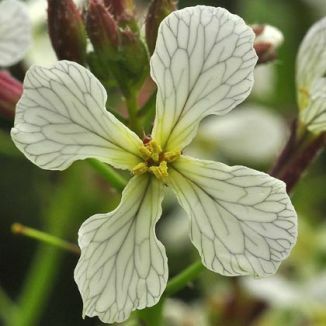 Described as 'a relict of cultivation', this plant has been chased out of arable land by herbicides and now is more commonly found on waste ground. 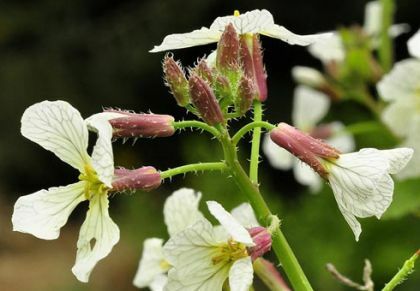 Wild Radish is also known as Jointed Charlock and in some countries, such as Australia, is being termed as an invasive species; it is known to spread rapidly. However it is much loved by bees especially as it flowers earlier than many of their other sources of pollen.